When your kids cry out for a hamster, you might be inclined to cry foul -- foul smell. After all, a hamster lives, eats and goes to the bathroom in his domicile. Your precocious kid might school you, though: Hamsters are not smelly animals. Odors emanating from a hamster cage are attributable to owners who lack the wherewithal to properly maintain the enclosure. Hamsters are obsessively clean creatures -- if you watch one, you're likely to see him cleaning himself with his tiny front paws, which he licks and runs over a portion of his fur to groom. Hamsters don't get in water voluntarily, and bathing one at all is discouraged and irregular. It's bad for a hamster's health. For one thing, a hamster can drown. He can catch a cold that leads to death. He will lose the protective oil that coats his fur. Hamsters prefer to keep themselves clean without going near the water. Hamsters don't just like to clean themselves -- they have to. Giving a hamster a bath could cause sickness and death. Hamsters have oils throughout their coats that protect their skin and help insulate them. If you bathe your hamster, you're going to strip off those natural oils. Your hamster could freeze before getting the chance. If your hamster gets something stuck in his fur, you're better off cutting it out than bathing your hamster. Hamsters don't stink but, if you aren't diligent, their cages sure will. A hamster's cage needs a full cleaning at least once a week. Dump all of the bedding and scrub the enclosure thoroughly with a mild detergent and warm water, then re-line it with brand new bedding. Otherwise, odors will accumulate and overwhelm both you and your little buddy. 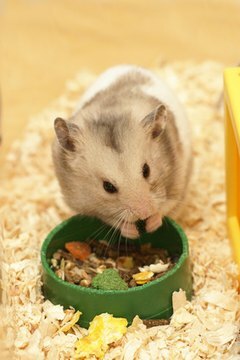 On the off chance that your hamster indeed is producing an odor, consult your vet sooner rather than later. A foul odor can indicate sickness, like intestinal or dental problems. A bad smell is a good indicator your hamster either rolled in something unpleasant -- in which case he'll clean himself off shortly -- or is under the weather and could use some medical attention.